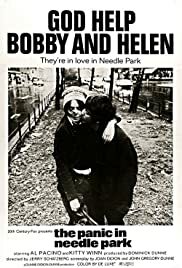 This movie is a stark portrayal of life among a group of heroin addicts who hang out in “Needle Park” in New York City. BEFORE: Schoolwork, and watching election coverage, continues to exact it’s toll on my ability to watch more films and for the first time in the marathon, I am behind schedule by two full days. The Panic in Needle Park was originally scheduled for Monday but has been postponed to today. The film brings back Al Pacino who hasn’t been in the marathon for just over a month (last seen in Insomnia). AFTER: The Panic in Needle Park is filled with many great performances but not much else. Al Pacino gives one of this better performances playing the heroin addict Bobby. Immediately upon seeing Bobby the first time, you can see his character perfectly clear. There is no ambiguity as to who he is or what he does and it is all communicated through visuals and Pacino’s acting abilities. Helen (Kitty Winn) evolves from a shy and mellow person into an addict as well, dependent on drugs. Winn does a good job portraying her descent to a place of no return and becoming well known amongst the people of Needle Park. My issues lie with the story and issues with Helen’s character development. Let’s start with Helen’s development because that also covers the beginning of the film. To start, Helen is not an addict, and while she is dating Marco (Raúl Juliá), a user himself, she is portrayed as someone who has never done anything in her life. Then almost instantaneously, she falls in love with Bobby and hangs out with all of his friends. This plot point, which occurs only a few minutes into the film, seems to come out of nowhere. It’s not explained and it doesn’t really make sense; it just happens and you are forced to go along with it. As I said before, Winn does a good job playing the character, but the character has many unforgiving issues. And as for an actual story, that was pretty much nonexistent. Much of the focus was placed on the actual consumption of the drugs instead of a developing plot. Now, I must give credit where it’s due, the depiction of drug use was very well done. According to Wikipedia, The Panic in Needle Park was actually the first film to show an actual drug injection. In this regards it tops my favorite drug film Pulp Fiction as well as some others (Trainspotting, Traffic) in terms of my visceral reaction. But other than that, there isn’t much here. The cops seemed to be tacked on to the story almost as a second thought and the direction of some of the characters, Helen’s in particular, seems to head nowhere and involves many non sequiturs. The Panic in Needle Park does a select few things extraordinarily well but everything else extremely poorly. Pacino does give a fantastic performance and it’s interesting to see one of his earliest films, but there isn’t much else going for it. I would shy away from this unless you really are determined to see it.